My co-sister makes this very often. I like her version of tomato chutney. Here is how she makes. Take a pan, pre heat oil, add mustard seeds, when it splutters add urad dhall, channa dhall, coriander seeds, coconut and red chillies one by one and fry it till golden brown. Change it to a small vessel. Now in the same pan, add onion and fry it till it becomes transperant. Add tomato and salt to onion and saute for another 2 mts. Let everything cool. Grind it into fine paste adding required amount of water to adjust the consistency. Serve it as a side dish for idly or dosa. 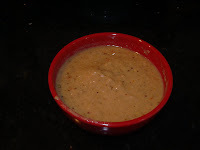 *** - Other than coconut chutney, I usually avoid using coconut for making chutneys. Instead increase the quantity of dalia split. Taste will definitely differ. Thanks Keethi, have added u too.